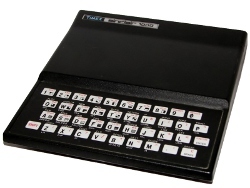 Well, the celebration of thirty years since the introduction of the ZX81 is now over. For the last year I've been bringing you an original ZX81 program each month as a tribute to my first computer. It was a lot of fun typing in those old programs or fixing tape recordings I made back in the eighties. I even rewrote one which brought me back to those old programming days. For those that found your way here, I hope you enjoyed my ramblings about the programs. Perhaps you've learned something or I just invoked a kinship from a fellow programmer. Since I still have a number of printouts lying around, I've decided to continue my habit. Each month, I will introduce another ZX81 program from my stash. Even if others never find these programs useful, it is forcing me to save more of my fading printouts. The goal of uploading another program each month presented me a challenge that I found difficult to ignore. I contemplated going for a weekly update, but I have other interests and didn't want to burn out over the year. It may take me a few years to get through them all, but at least I'm making progress. I actually have my latest program ready to go, I just need to upload the picture and write the article. As a hint it is a driving game!